Egyptian President acknowledges for the first time that Russian plane crash in the Sinai Peninsula in October was a terrorist attack. 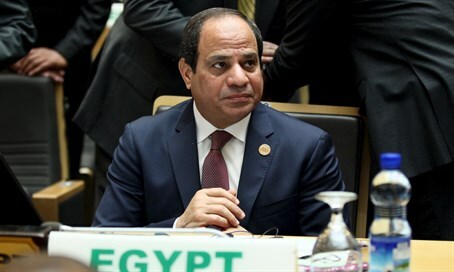 Egyptian President Abdel Fattah al-Sisi acknowledged on Wednesday for the first time that "terrorism" caused a Russian plane crash in the Sinai Peninsula in October that killed 224 people, AFP reports. "Has terrorism ended? No... Whoever downed that plane, what did he want? Just to hit tourism? No. To hit relations. To hit relations with Russia," Sisi said in a speech quoted by the news agency. Sisi had previously dismissed as "propaganda" a claim by the Islamic State (ISIS) jihadist group that it was behind the downing of the airliner on October 31. The jihadist group said it smuggled a bomb on board the plane in the airport of Sharm el-Sheikh, a Sinai resort popular with Russian holidaymakers, later claiming the bomb was planted inside a soda can. Russia had quickly concluded that a bomb brought down the airliner, and suspended flights to Egypt. Britain followed suit and also stopped flights to Sharm el-Sheikh. The attack dealt a major setback to Sisi, who had been at pains to revive the country's tourism industry and impose control over the restive Sinai Peninsula. Egypt has set up a committee to investigate the attack, and previously insisted it be allowed to finish its probe before any conclusions were made. On November 17, Russia's President Vladimir Putin announced that Russian investigators had found evidence of a bomb on board, and vowed to punish the attackers. "We will search for them anywhere they might hide. We will find them in any part of the world and punish them," he said at the time, according to AFP. Egypt has since hired a British firm to review security at airports, including procedures to check passengers and baggage, and security equipment in the airport. The country has been dealing with an insurgency in the Sinai that goes back to the days of former President Hosni Mubarak but which has gotten worse since Mubarak's successor, the Islamist Mohammed Morsi, was ousted by the Egyptian military headed at the time by Sisi.